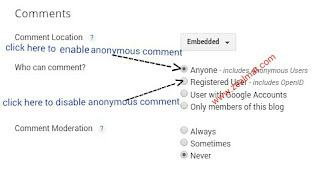 The blogger comment box enables your blog visitors to share their own satisfaction of your blog post and also the pride of any Blogger is to get more comment on each post daily but there are things you need to put in place so that your visitors can or cannot have access to comment. The benefits of Blog commenting are too many like adsense approval, creation of audience, blog becomes trusted, and many more. 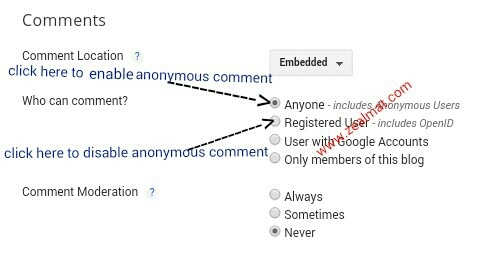 Do today am going to be talking on how to enable/disable anonymous comments on blogger, just follow the steps below. Go to your blogger dashboard and then select your preferred blog which you will like to work on. Now move your mouse arrow down to the "Settings" tab then click on "Post and Comments"
Finally click on the "save settings" button and that's all. You can now visit your blog and check it out for yourself, and don't forget to drop your comment below thanks.